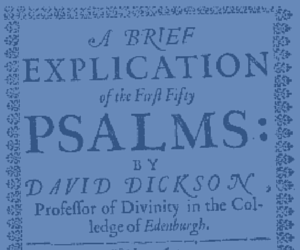 Dickson (c.1583–1663) was a professor of theology whose writings are both plain and concise. He wrote commentaries on many different books of Scripture. Dickson was a helpful counsellor to many in their spiritual difficulties. The Stewarton revival took place during his ministry in Irvine. Many from the parishes around attended his weekly exposition of the Scriptures. There were multitudes of converts during this time. He opposed the unbiblical worship and church government foisted on the Church in Scotland. As a consequence, he sentenced to exile in Turriff for several years. He refused allegiance to Charles II’s claimed supremacy over the Church. This cost him his post, but his final days were drawing near. On his deathbed he said “I have taken all my good deeds, and all my bad deeds, and have cast them together in a heap before the Lord, and have fled from both to Jesus Christ, and in Him I have sweet peace”.